The rapid expansion of searchable protein and DNA databases in recent years has triggered an explosive growth in the application of mass spectrometry to protein sequencing. 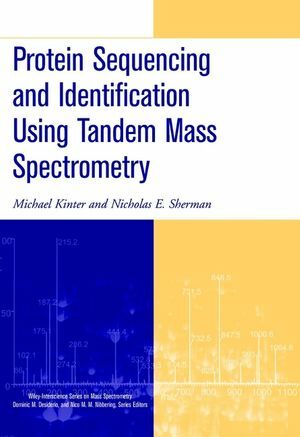 This timely and authoritative book provides professionals and scientists in biotechnology research with complete coverage of procedures for analyzing protein sequences by mass spectrometry, including step-by-step guidelines for sample preparation, analysis, and data interpretation. MICHAEL KINTER, PhD, is an associate staff member in the Department of Cell Biology, Lerner Research Institute, Cleveland Clinic Foundation. NICHOLAS E. SHERMAN, PhD, is an assistant professor of research in the W. M. Keck Biomedical Mass Spectrometry Laboratory, Department of Microbiology, University of Virginia. An Introduction to Protein Sequencing Using Tandem Mass Spectrometry. The Primary Structure of Proteins and a Historical Overview of Protein Sequencing. Collisionally Induced Dissociation of Protonated Peptide Ions and the Interpretation of Product Ion Spectra. The Preparation of Protein Digests for Mass Spectrometric Sequencing Experiments. Mass Spectrometric Analysis of Tryptic Digests. Protein Identification by Database Searching. Sequence Analysis of Novel Proteins. The Characterization of Post-Translationally Modified Proteins Using Tandem Mass Spectrometry.